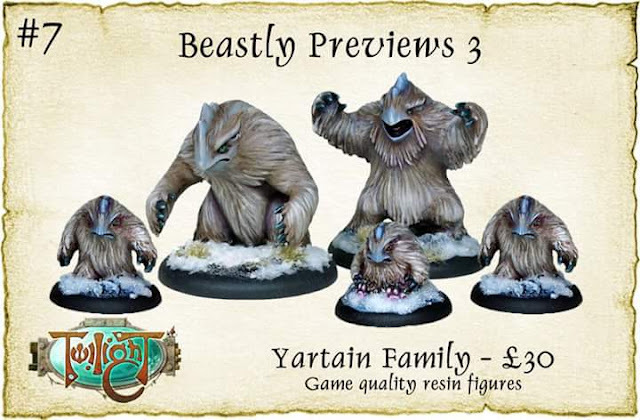 Twilight Miniatures: Our Salute 2018 previews continue with the general release of the Yartain family! Not only are these awesome sculpts, but the full rules for using them in a game of Twilight can be found in our new Compiled Traveller 2, also on sale at Salute! Barbaric Splendor: Llama Queen and War Llama Pre-Order! Alternative Armies: Grinning Skull and SHM New Releases! Breaking! Element Games: Discounted Star Wars Legion: Clone Wars Miniature Game Pre-Order! Alternative Armies: Armoured Goblin Knights With Separate Weapons 28mm Scale Now Released! Warlord Games previewed their new Bolt Action Korea War Miniatures! The Terrain Tutor: Terrain Essentials - An Essential Guide to Building Tabletop Terrain Kickstarter Ending! Northstar Miniatures: New Ghost Archipelago 'Gods of Fire' Characters! - Northstar Miniatures previewed these new Ghost Archipelago 'Gods of Fire' characters! Cartoon Wednesday - Copyright Drew Litton Maybe a little late for this one. Rebel Minis Black Friday Sale! - Our First Ever! Check it out: Have a Great Thanksgiving! Greek Light Cavalry - Some Greek Light Cavalry; from the Victrix set of the same name. I did add in a few heads from the spares box. Armageddon x 7 - Played a massive 7 person game of Shadow war Armageddon. A fun game with a great group of people, some great figures and great terrain. Book time! - Got home from work at 10.45pm and these are waiting for me. This weekend will be one of reading! Order of Illumination NPC for IKRPG - This guy was a favorite with my group. Blessed double-barrelled scattergun plus that book with the writings of Morrow and Thamar... what's not to love? Sedition Wars - WIP - Finally got up the will to start on these, great sculpts but poor execution. A thing! - I've posted a thing! But it's not here, it's over there. Chaos on the red planet! Wargame News and Terrain ©Copyright 2010-2019. All rights reserved. All names, trademarks, and images are copyright their respective owners. Rights Reserved By Wargame News and Terrain - This hobby blog contains affiliate links. Powered by Blogger.